301/365(+1), a photo by Luca Rossini on Flickr. There’s this corner of Porta Portese where the time seems to have slowed down. 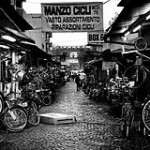 If it wasn’t for the goods, mainly bikes, everything would suggest to be in the forties, just after the war, when Rome was a poor city at the verge of a massive transformation which would have brought it in less than ten years to become in the whole world a synonymous of “la dolce vita”. The transformation, for how massive and capillary could have been, didn’t affect this little corner of the city. 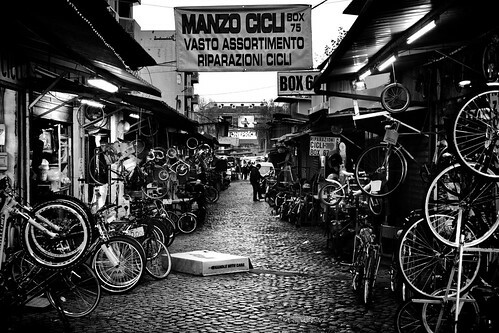 The vendors are still the same, old, wrinkled, charismatic and characteristic Roman characters, and their shops are as old, wrinkled and charismatic, but dirty and a little smelly too. This place reminds me of the few areas of Tokyo, usually under the elevated railways, which still look “Asian”, spots which seem to have been (luckily) forgotten by progress, areas so genuinely populated by the citizens and usually providing such peculiar services to become the fiercest testimonies of how sometimes preserving the shape, the role and the soul of “slums” can generate much more benefits than transforming everything into the very same, global, and often soulless kind of innovation. That said, I finally bought Claudia the bike I promised her for her birthday (which was more than one month ago, shame on me! ), together with the little seat and little helmet to carry Agata along. Afterwards we went to the basement, collected our Christmas decorations, and eventually fixed the (plastic) Christmas tree, the creche, and a few extra decorations around the house, as tradition wants to be done here in Italy on the eighth of December. This time, however, we had much more fun than usual, because Agata is finally old enough to appreciate all these Christmas amenities, and when she has fun we always have fun.